Home Blog Have You Accepted Your Cross? 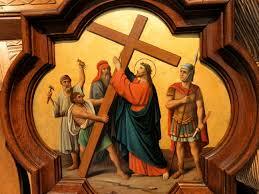 In the Second Station, Jesus accepts his Cross. He’s been condemned and now is made to carry his own instrument of torture. And he simply accepts it. Without hesitation, he accepts the Cross that is formed by our sins. It would be one thing to accept a punishment that you deserve because of your own sins. But, to accept a punishment that someone else deserves? The funny thing about crosses is that, for as daunting as they are, they are an invitation. Your cross is an invitation from God to become strengthened, blessed, and redeemed. At first sight, it’s ugly, even horrifying. But the longer you carry it, the more beautiful it becomes. The key is to accept it in faith. Sadly, many of us – including myself – try to avoid accepting our cross. Sometimes we decline it entirely. We may feel freer, lighter initially. But in the end, we’ve missed out on something grace-filled and profound. Have I accepted my cross?